HMS Astute is the lead ship of her class of nuclear-powered submarines. Astute was ordered from GEC's Marconi Marine (now BAE Systems Submarine Solutions) on 17 March 1997. She was laid down on 31 January 2001, 100 years to the day since the keel was laid down for HMS Holland 1, the first Royal Navy submarine. The vessel was built at BAE's submarine facility in Barrow-in-Furness and was launched on 8 June 2007 by HRH The Duchess of Cornwall. Astute is the second submarine of the Royal Navy to be named for the characteristic of shrewdness and discernment. The first was the World War II Amphion-classAstute. Now that she has been commissioned, Astute is one of the most 'advanced submarines in the world'. Astute left Faslane for sea trials and dived for the first time on 18 February 2010 and was commissioned on 27 August 2010, when she was given her HMS prefix, in a ceremony watched over by her patron, HRH The Duchess of Cornwall. On 22 October 2010, the Ministry of Defence confirmed that Astute had "run into difficulties" off the Isle of Skye while on trials after eye-witnesses reported the submarine had run aground a few miles from the Skye Bridge. There were no reports of injuries. The captain of the vessel elected to wait for tug assistance, rather than use the submarine's own power to clear the stern from the obstruction, to minimise the damage to the hull's anechoic tiles. A Royal Navy spokesperson said the vessel had been grounded on silt, and was re-floated at high tide. The Maritime and Coastguard Agency chartered emergency tow vesselAnglian Prince was despatched to the scene from Stornoway. During the operation to tow Astute clear, there was a collision between the rescue tug and the submarine, which resulted in damage to her starboard foreplane. The submarine returned under its own power to Faslane, where the damage incurred in the grounding and afterwards was described as "minor". 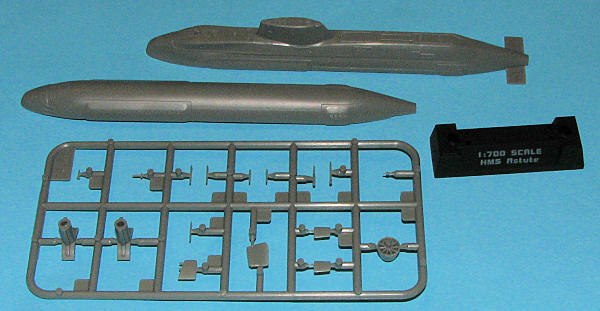 Modern submarines make for relatively simple models thanks to the lack of 'stuff' hanging from hull and when the scale goes down, so does the parts count. Having done a superb kit of this boat in 1/350, it was normal to find it in an even smaller scale as 1/700 is so popular with those who don't have a lot of display space. So it is with this new kit of the UK's newest submarine, the somewhat snake-bitten HMS Astute. As usual, the sprues are in separate poly bags with some of the finer bits wrapped in foam sheet. There really isn't much to this one though the builder will have to break out the drill twist set. The various antennas and things on the bridge will need to have their mounting holes drilled by the modeler prior to installation. The rest of the build is simply assembling the hull halves, the upper and lower stabilizers, the dive planes and the rear prop housing. Those particularly unmotivated can leave off the upper bridge stuff as those would be fully retracted when under water. A three piece display stand with the boat's name already printed on it and a nicely done decal sheet (not shown) complete the kit. Building instructions are on the back of the box and a large, full color painting and decal guide is included inside. This is a great kit for a rainy day or just to do something that is easy every once in a while. I fully enjoyed building thebigger version, and I'm sure this smaller one will be a ton of fun as well.